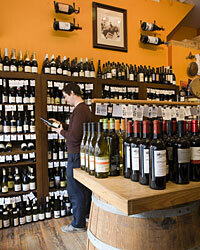 It’s not enough to just stock terrific bottles: An outstanding wine shop must also have a strong point of view. These new stores all do, reflecting their owners’ passions. By opening Little Vine, husband-wife owners Jay Esopenko and Melissa Gugni created a kind of clubhouse for their North Beach neighborhood. 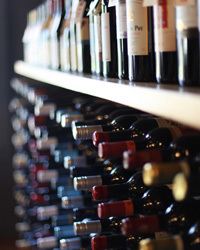 The walls of the teeny shop are lined with over 150 wine selections, mostly from very-small-production, family-owned California wineries like Cobb, Matthiasson and Sean Thackrey. 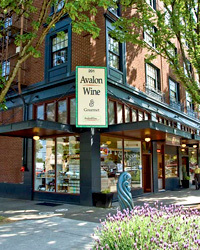 Every Thursday evening, Little Vine invites a winemaker to pour samples and hang out with customers. 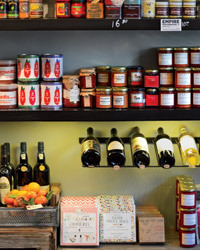 Beyond wine, Little Vine also sells picnic essentials, like local Barinaga Ranch cheese, Fra’ Mani charcuterie and Heslet Honey from hives just up the street. shoplittlevine.com. “If I didn’t have to consider finances, I’d probably just carry 200 Muscadets and call it a day,” says Noel Sherr, a partner and wine buyer for Cave Taureau. Despite his passion for Muscadet and other wines from France’s Loire Valley, he seeks out excellent choices from around the world, including some small California producers. Still, Muscadet is a specialty of the shop, which is modeled on Sherr’s favorite cavistes (artisanal wine merchants) in Paris. He sells more than a dozen Muscadets and even carries the favorite beer of Loire winemakers, Brasserie de la Pigeonnelle Loirette. cavetaureauwines.com. John Keife and Jim Yonkus’s handsome shop in New Orleans’s artsy Warehouse District, with its floor-to-ceiling wooden shelves loaded with wine, feels like a library, a speakeasy and a market all at once. The hand-picked wine selection runs the gamut from a truly impressive $15 bottle of Camino de Navaherreros Garnacha from Spain for everyday to expensive bottles of Burgundy. The same care goes into the foods on offer. “We have some of the best Parisian caramels and artisanal olive oils and vinegars, as well as something as simple as the best Dijon mustard—that’s important,” Yonkus says. The Dijon, by the way, is from France’s Eric Bur. keifeandco.com. 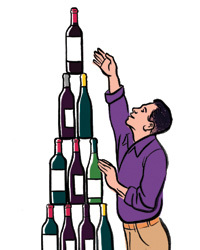 Gavin Fine always had a talent for picking good wines for his four Jackson Hole restaurants. So much so, in fact, that “Wine shops in the area used to call me and say, ‘Hey, what are you pouring by the glass at Rendezvous Bistro or Il Villaggio Osteria? We want to carry them, because people keep asking for them.’ ” Now at his own new shop, Bin 22, he sells every wine he serves by the glass in all of his restaurants. Three sommeliers help customers with pairings, choosing from the Italian-heavy selection of value-priced ($10–$15) bottles. The attached wine bar serves 25 wines by the glass, small plates and six house-made mozzarellas. bin22jacksonhole.com. In a sliver of a space between a creamery and a charcuterie counter in DC’s new Union Market, Eric Rohleder has managed to squeeze in a terrific 350-bottle wine and beer shop. “When we opened, we thought we’d need to focus mostly on affordable grab-and-go bottles for people to take home for dinner that night,” says Rohleder. 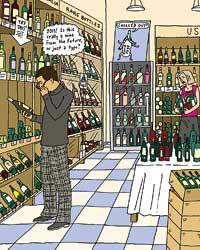 “But then customers came in looking for grand cru Burgundies and Brunellos and culty California wines, so we added those.” Soon, all of the wines will be available online, too. cordialwine.com. Since it opened five years ago, The Ten Bells wine bar in Manhattan has become a magnet for people looking for natural wines. The selection is particularly strong because owner Fifi Essome travels throughout France to source wines to import exclusively. Now, he’s launched a shop in Brooklyn and packed the 300-square-foot space with more than 200 natural and organic choices, including nine from Burgundy’s incredible Alice et Olivier De Moor, plus hard-to-find magnums. Essome has also taken an interest in hyper-local spirits from producers like Brooklyn Gin. 718-398-1800. Los Angeles blogger Whitney Adams of brunelloshavemorefun.com worked with artist friends to create items for this new online shop: beautiful grape-leaf coasters, graphic bottle-wrapping papers, tasting journals, even tie-dyed leather cocktail napkins. bottlestockshop.com.